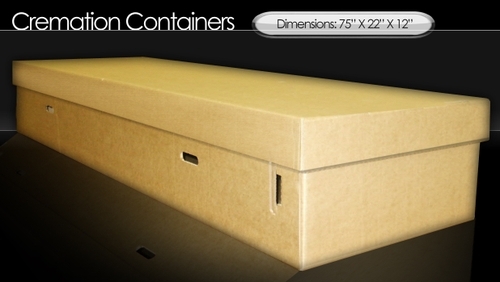 This cardboard coffin ships flat and has a 500-700# test cardboard insert in the bottom. It is the easiest container we've found to assemble. Its special cut-out fastening system causes the coffin to go together quickly and "latch" together, with tape, staples, brads or cord used to reinforce the assembly. It can be painted or covered with photos and other forms of personalization. Our containers create an inexpensive option for those who want to either spend less money or participate in a hands-on fashion with their final packaging! Our containers are designed and assembled at a workshop that serves physically challenged persons in a safe and respectful work environment. They are located just two blocks from the mill where the containers are made, so the carbon footprint on this product is as light as we can make it.